With the launch of the Hamburg Open Online University projects „Fluchtwege – Urbane Gefüge der Migration“ and „Project Management in Urban Design“, the teaching and research programme Urban Design presents two practical forms of urban knowledge production processes. How do I live when I am accommodated? What is the impact of the EU-Turkey deal on the Turkish coastal town of Izmir? How and in which assemblages is the right to the city articulated? What does working have to do with staying and being active to do with living? 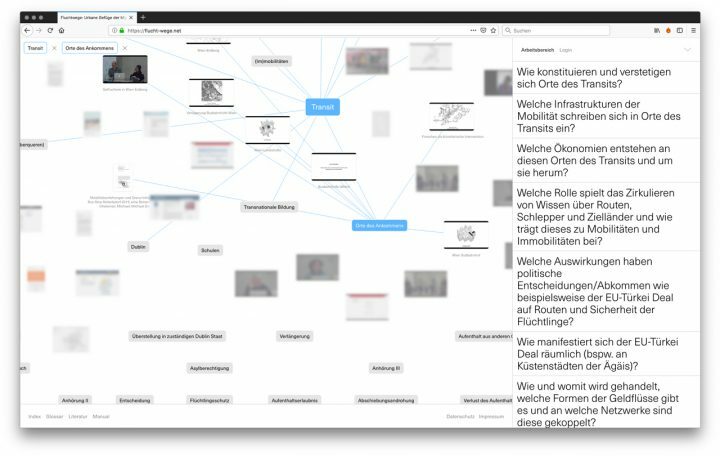 „Fluchtwege – Urbane Gefüge der Migration“ negotiates in the form of an interactive network the dynamic structures of action of migration and city and connect the fields of action transit, law, housing, work, education, resentment and the right to the city. „Fluchtwege – Urbane Gefüge der Migration“ enables a multi-perspective analysis of interdisciplinary knowledge production and at the same time calls for new connections between specialist positions to be worked out, questioned, reconnected and thus opened up to new levels of knowledge. The content collected on the website was presented during the HafenCity Lectures 2016/17 „Vom Kommen und Bleiben. Wie Migration Stadt produziert“ (Kommen & Bleiben I, Kommen & Bleiben II), the urban design projects „Fluchtlinien“ (Urban Design Project III Fluchtlinien, 2014/15) and „Wohnen in der Parapolis“ (Parapolis – City of Residents 2015/16) as well as in Urban Design final theses and were developed and extended by scientific essays in the fields of flight, migration and city. In the Basics format of the e-learning arrangement, the practical form Modes of Play was developed over and through the model project Building a Proposition for Future Activities – a confrontation and translation of semiotics with what it means to work today towards the urban. 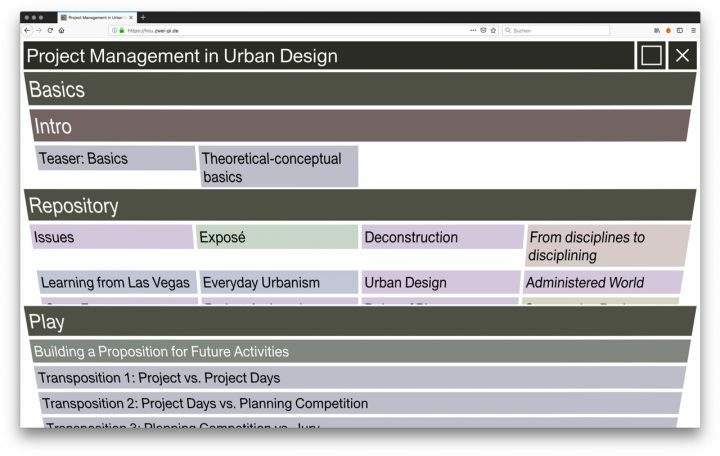 The format Repository brings together aspects of urban knowledge production processes in the categories description, conceptual practice, reference, synthesis and manual. In the Play format, subsequently visited, concrete situations and arenas from the course of the project are reflected on by means of visual-spatial forms of reasoning and designing in order to determine which of these can be constructive for undone projects in urban design. The differently open forms of representation of the model project and the focus on the performative dimensions of the knowledge production processes introduced therein via the Hamburg Open Online University platform point to the fact that the mediatization of knowledge production processes also includes enabling architectures. The project Building a Proposition for Future Activities was co-produced by members of the teaching and research programme Urban Design at HafenCity University, a neighbourhood initiative, actors in district and city administration and politics, and current and future neighbours in the Poppenbüttel district from December 2015 to March 2018. It is part of the Accommodation with Perspective Dwelling programme, which is based on amendments to the legal status of „dwelling“ and „accommodation“ respectively, and was designed to deal with the housing crisis of the mid-2010s.